Rublev Colours are different from other commercial oil colors. One reason is we use natural and historical pigments like those used by the old masters. Another is we make them as they did before modern oil colors - without additives. Rublev Colours Artists oils are formulated to maintain the unique characteristics of each pigment in oil. What you find in each tube is unique due to the pigment inside, giving you new choices of texture, opacity, consistency, tone and hue. With Rublev Colours you experience the transparency of yellow ocher, the pale coolness of green earths, and the crystalline glitter of blue zurite. The particles of natural pigments are larger and more varied than pigments in modern artists' oil colors. When we remember how crystalline pigments, such as azurite, malachite, lazurite, were used in old masters' paintings, is easy to understand how these beautiful surfaces with broken lights were obtained. An examination, for instance, of azurite particles under the microscope at once reveals the beautiful mass of blue and blue-green crystals, reflecting light in all directions, and thus of course enhancing the visual effect. Rublev Colours Artists Oils do not contain additives, such as filler, driers and stabilizers - simply pigment and oil. We use linseed oil in our paint sometimes with a small amount of heat-bodied linseed oil. Stabilizers, such as stearates and waxes, that diminish the individual effects of pigments are not added. You will find different consistencies from color to color due to individual pigment characteristics. Some colors brush out long, others short and buttery and still others are thixotropic. Overall, Rublev Colours Artists Oils have longer brushing consistency than most tube colors today, making them ideal for both bristle and soft hair brushes in fine rendering on both fine-weave canvas and smooth panels. When you see a color name on our label, you get just that - one pure pigment. For example, Rublev Colours Vermilion is not hue, but the pigment - pure red mercuric sulfide. 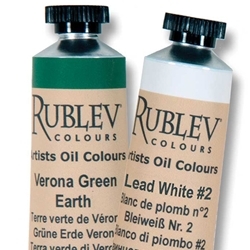 In a tube of Rublev Colours Green Earth you will not find a mixture of pigments, but the real thing - green earth. And Rublev Colours Naples Yellow is pure lead antimonate. You won't even find the word "genuine" used to describe Rublev Colours because all colors are simply that - genuine. All our earth colors have outstanding lightfastness and most of the others are permanent when used full strength. Rublev Colours Artists Oils offer an extraordinary range of tinting strength and an immense diversity between opacity and transparency.